CLEVELAND -- A white Cleveland patrolman who fired down through the windshield of a suspect's car at the end of a 137-shot barrage that left the two unarmed black occupants dead was acquitted Saturday of criminal charges by a judge who said he could not determine the officer alone fired the fatal shots. Michael Brelo, 31, put his head in hands as the judge issued a verdict followed by angry, but peaceful, protests: Outside the courthouse police blocked furious protesters from going inside while across the city others held a mock funeral with some carrying signs asking, "Will I be next?" "It brings tears to my eyes to know again that justice has not been served," Art McCoy of the Black Man Army, a coalition of black leaders, told CBS Cleveland affiliate WOIO-TV outside the courthouse after the verdict. 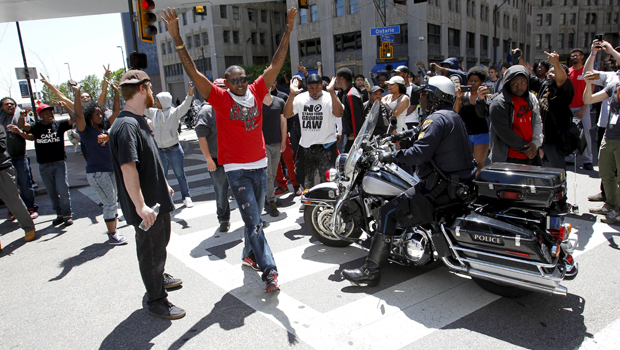 As demonstrations continued into the night, police in riot gear made multiple arrests, WOIO-TV reported. At least three people were arrested for "aggravated riot, felonious assault, [and] obstructing justice" after someone threw an object through a restaurant window around 6:30 p.m., injuring a woman inside, the police department tweeted. A few hours later, more than a dozen people were arrested for failing to disperse from an alley in the city's Warehouse District on downtown's west side, according to deputy police chief Wayne Drummond. Dozens of Cleveland police officers and state highway patrol troopers lined the alley, with some protesters standing and argued with police by the alley for several minutes. Police could be heard at a variety of locations downtown telling protesters to disperse or be arrested. Brelo's acquittal came at a time of nationwide tension among police and black citizens punctuated by protests over deaths of black suspects at the hands of white officers -- and following a determination by the U.S. Department of Justice that Cleveland police had a history of using excessive force and violating civil rights. Before issuing his verdict, Cuyahoga County Common Pleas Judge John P. O'Donnell reflected on the unrest in Ferguson, Missouri, and Baltimore over the deaths of black suspects but said he would not offer up Brelo to an angry public if the evidence did not merit a conviction. Brelo -- who fired a total of 49 shots, including 15 down through the windshield while standing on the hood of the suspects' vehicle -- faced as many as 22 years in prison had the judge convicted him on two counts of voluntary manslaughter for his role in the end of a chase that began after Timothy Russell's beat-up Chevy Malibu backfired. His sister, Michelle Russell, said she believed Brelo would ultimately face justice, despite the judge's decision. "He's not going to dodge this just because he was acquitted," she said. "God will have the final say." Michelle Russell urged protesters to be peaceful and work for real solutions. "We need to organize and figure out a way to stop this from happening again," she said. About 200 people walked in a mock funeral procession that had already been planned to mark six months since another deadly shooting that sparked anger in Cleveland's black community: the killing of Tamir Rice, a black 12-year-old boy carrying a pellet gun who was shot by a white rookie officer. Protesters carried a black, plywood coffin and softly sang "I'm going up yonder, we're marching, we're marching." The crowd was a mix of blacks and whites walking peacefully in a park and along the streets near the home of the county prosecutor as neighbors looked on. Several police officers followed the march on foot and on horses. Some carried signs saying "I Can't Breathe" and "Freddie Gray Lynched," references to a pair of police-involved deaths: the chokehold death of Eric Garner in New York City and the death of a Baltimore man who suffered a spinal injury while in custody. One activist, Carol Steiner, said the verdict is "a very bad precedent for Cleveland" with a decision still to come in the Rice case. "Police murder people of color and not have to serve one day in jail." The U.S. Justice Department, U.S. Attorney's Office and the FBI will review the testimony and evidence and examine all available legal options, said Vanita Gupta, head of the Justice Department's Civil Rights Division. After the verdict, sheriff's deputies stood in front of the courthouse carrying clear shields as protesters chanted "Hands up! Don't shoot!" - a rallying cry that became popular after the death of 18-year-old Michael Brown in Ferguson. One demonstrator bowed his head with hands folded in front of the phalanx of deputies, praying in silence. O'Donnell spent nearly an hour on an involved explanation of his decision that included mannequins marked with the gunshot wounds that the two motorists suffered on Nov. 29, 2012. Brelo could have been convicted of lesser charges of felonious assault, but O'Donnell determined his actions were justified following a chase that included reports of shots being fired from Russell's car, because officers perceived a threat. Brelo's lead attorney, Patrick D'Angelo, said his team was "humbled by the verdict but not emboldened by it." "Officer Brelo risked his life on that night," D'Angelo said, only to be attacked by prosecutors in a prosecution he called "unprofessional" and a "blood fight." Cuyahoga County prosecutor Tim McGinty said he respects the judge's decision and urged others to do so, as well. He said the case forced police and the public to face hard truths. "This tragic experience has already forced a culture change within the division of police and a needed reexamination of the use of deadly force," he said. "The end result will be less secrecy, additional transparency and accountability." Thirteen officers fired at the car with Russell and Malissa Williams inside after a 22-mile high-speed chase that involved 62 marked and unmarked cars and reached 100 mph. The pursuit began when Russell's car backfired as he sped past Cleveland police headquarters and police officers and bystanders thought someone inside had fired a gun. Brelo was the only officer charged because prosecutors said he waited until the pair was no longer a threat to fire his final 15 rounds. Russell, 43, and Williams, 30, were each shot more than 20 times. While prosecutors argued they were alive until Brelo's final salvo, medical examiners for both sides testified that they could not determine the order in which the deadly shots were fired. Brelo has been on unpaid leave since he was indicted May 30, 2014. Police Chief Calvin Williams said Brelo's leave will continue during disciplinary reviews for him and the other 12 officers. Authorities never learned why Russell didn't stop. He had a criminal record including convictions for receiving stolen property and robbery and had been involved in a previous police pursuit. Williams had convictions for drug-related charges and attempted abduction. Both were described as mentally ill, homeless and addicted to drugs. A crack pipe was found in the car. The shooting helped prompt an investigation by the Department of Justice, which concluded the department had engaged in a pattern and practice of using excessive force and violating civil rights. The city and DOJ are currently negotiating over reforms. In addition to the charges against Brelo, a grand jury charged five police supervisors with misdemeanor dereliction of duty for failing to control the chase. All five have pleaded not guilty and no trial date has been set. "Our pursuit of justice for Timothy Russell and Melissa Williams is not over," McGinty said.